Why not install a truly unique countertop material? Spice up your life--and who cares if you're the talk of the neighborhood? Formica 180fx, and it's a laminate pattern that recreates the visual chaos of real granite. 180fx™ reproduces the look of natural granite without the repetition of pattern found in most laminates. An innovative improvement on good old fashioned laminate countertops. However, it is still laminate, and prejudices linger among homebuyers when it comes to this material. Thus, lower resale value. Stainless steel has risen to the upper rank of countertop ideas in the last ten years, as "foodies" has striven to duplicate restaurant-quality kitchens in their own homes. Impress friends and relatives with your extremely non-porous and beautiful kitchen countertop. On the downside, going this route is a good way to chop out a big slice of your wallet with this ultra-expensive, hard-to-fabricate material. Thick, poured concrete created by a professional company that specializes in this. Concrete allows for a truly infinite range of design possibilities: color, size, thickness, etc. This is the only countertop material that will adapt to your kitchen, rather than your kitchen adapting to the countertop. More expensive than you might imagine, concrete also can crack and scorch. Bigger than tile granite, smaller than slab granite. Modular granite is a great compromise for enterprising do-it-yourselfers. These super-sized granite tiles minimize the annoying seams you would get with conventional 12" x 12" or 6" x 6" granite tiles. Even though modular granite's installation process is unique, it aims to duplicate the look of that very ordinary countertop: slab granite. While modular granite is one of the more innovative countertop ideas to roll around recently, it has not really taken off yet. Would you believe a kitchen countertop made of wood? Not just that, but reclaimed, recycled, salvaged--or whatever you care to call it--wood. This is hardwood such as maple, ash, and oak from old barns and commercial properties. Reclaimed wood is absolutely gorgeous and it verifies your "green" credentials. Few homes have wood countertops, much less reclaimed wood countertops. But wood requires a high degree of maintenance that non-organic materials such as solid-surface do not need. Pictured, ThinkGlass' counters are 1.5" of solid glass. If that is too thin for you, they can even create glass counters up to--ready for this?--1.5 feet thick. The company assures that with normal use, they will not chip or crack. Shatter? Not a chance. Solid glass counters are a big deal, and nobody in your neighborhood has one. ThinkGlass calls glass a "noble" product, and for $200 to $400 per square foot, I must concur that only nobility can afford it. Still, who can argue with any counter material that allows for embeddable LEDs, ranging in color from True White to Fuscia? "Quartz" implies a shimmering type of countertop material, full of gold and silver flecks. Right? This one was a trick question. Quartz countertops is a feel-good industry term for a common countertop, an engineered stone such as Caesarstone. This countertop is engineered from a combination of crushed quartz, other stone, and polymer binding agents. It looks super, and performs better than granite. Still, it is not cheap: quartz rivals slab granite's cost at $50 to $100 per square foot. Like stainless steel countertops, this one is a thin layer of metal wrapped over a base. Instead of stainless steel, the metal is zinc. Zinc countertops?" You want unique? This is unique. Even Ernest Hemingway writes about zinc countertops in the bistros of post World War I Paris. Zinc countertops, typically 1/16" thick, develop a fine patina of hairline scratches over time. These countertops have been used for a long time for bar surfaces. Not in love with those scratches? No problem. Just sand them out. 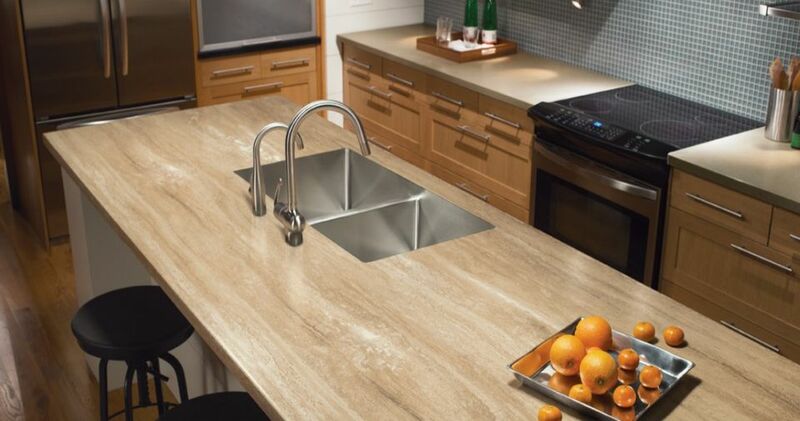 Paper countertops are often 100% post-consumer recycled cardboard and, as one of the biggest manufacturers, PaperStone, states, "[is] a petroleum-free resin that contains natural ingredients like cashew nut shell liquid. You might already be using paper as your countertop material. Laminate counters are a particleboard base, topped with a laminate sheet that is composed of resin-impregnated paper. Yes, paper. Post-consumer recycled paper is the greenest of the green countertop materials. But like other unique materials listed here, it is still very difficult to obtain. Leading paper countertop manufacturer PaperStone saturates individual sheets of paper with petroleum-free resins and consolidates them under extreme heat and pressure in an industrial press. The result is a solid surface material, meaning the same thing through and through. Solid surface is not just a product description but a category of countertop materials, much like Corian. On top of that, all of the paper is 100% post-consumer recycled material. Now, how green is that? Alkemi makes countertops out of aluminum, acrylic, and yes, polyester. They use virgin polyester resin (meaning, no recycled shirts) and has a minimum of 34% recycled content. It is non-porous on the surface, so no sealing is needed there. However, cutting the edges will expose pores, so those must be sealed. So, your slightly off-kilter neighbor Larry is selling his house and going into assisted living. But not before getting rid of his 1976 Corvette Stingray and selling off his old disco shirts at a yard sale. What better use for polyester shirts than turning them into kitchen counters? Sounds like a killer conversation piece. Except that, despite the name, polyester counters are very much like that staple of millions of kitchens already: solid surface counters. You'll pay a price for this conversation piece. Alkemi says that their polyester surfaces cost the same as high-end solid surface materials, which can be pretty expensive. Concrete skimmed by hand over a cement backerboard, smoothed, and waxed. No, this isn't a concrete counter in the traditional sense. This is no concrete pour; this is a skim-coat. One of the smartest accounts that I have read comes from intrepid Minneapolis resident, Sarah Riedl, who, unlike those who just think about it, actually followed the dream. She wanted to skim existing counters, but none existed. So, she and husband Chris constructed a top made of: 1"x2" frame, 1/2" OSB, and 1/2" cement backerboard. Then they laid down 3 coats of Ardex Feather Finish, sanded, and covered it all with carnauba wax. She reports that, 4 months later, the concrete was beginning to scratch, despite mitigation efforts, like religiously using cutting boards (she says that even dropping keys on the counter will scratch them). But for a total of only $150 in materials, she feels it was worth it. Just so we're clear, this is not your typical countertop resurfacing operation like the Rustoleum Countertop Transformations kit. While a fine product, the Rustoleum kit is one quart of material and it spreads on with a roller. This epoxy-based resurfacer, instead, comes in gallon quantities and pours on. As a surface material, poured epoxy is a bit schizophrenic, occupying both the world of brewpub "penny floors" and world-class biomedical facilities for laboratory tables. Epoxy counters can take up to 518 degrees F before distorting. Its Achilles Heel is thermal shock (moving the frozen turkey from the counter and replacing it with a hot pan). Water absorption basically doesn't exist, as epoxy-resin sips up only 0.008% water after 24 hours (by contrast, porcelain tile, which is rated as "impervious," soaks up .5%). Epoxy resin adequately mimics marble. But it really excels with those in-your-face solid colors like the pictured bottle green from Countertop Epoxy.